Well, not necessarily a chart per-se, but this allows us to plan. 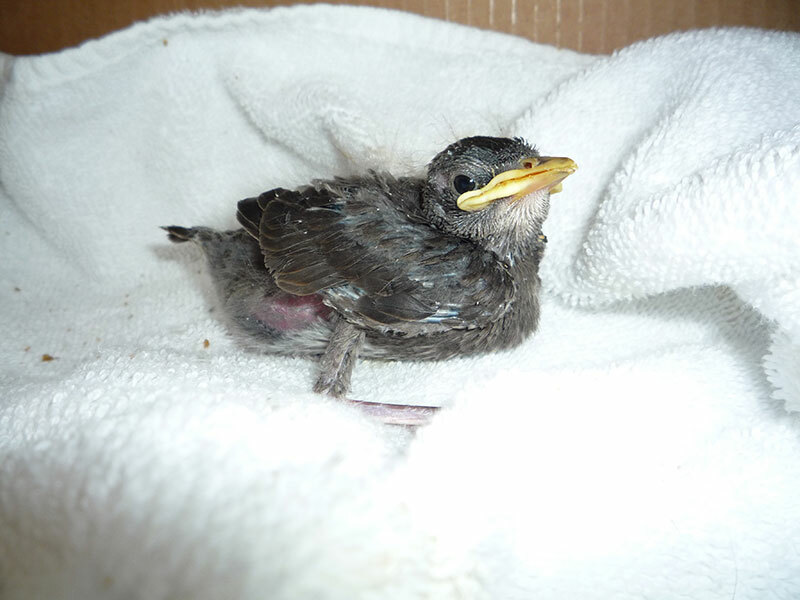 Raising a baby bird requires a lot of time and dedication, and European Starlings are no exception. What follows is just our experience; I’m certain that there are various factors and YMMV. However, it helps to have a frame of reference. The male European Starling will start finding it’s preferred nest to claim. Here in the Pacific Northwest, this generally means around mid-February. 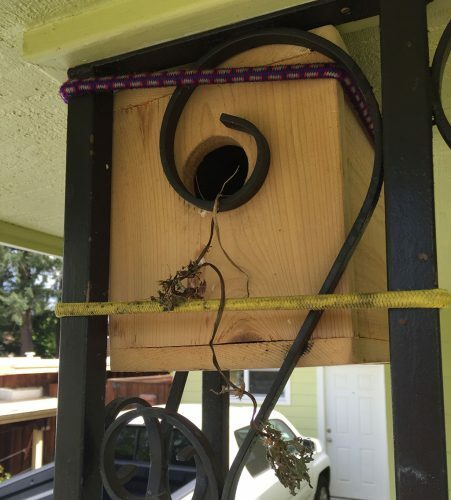 The male will put assorted materials in the nest and occasionally hang certain yard findings out of the opening as if to announce the open house. 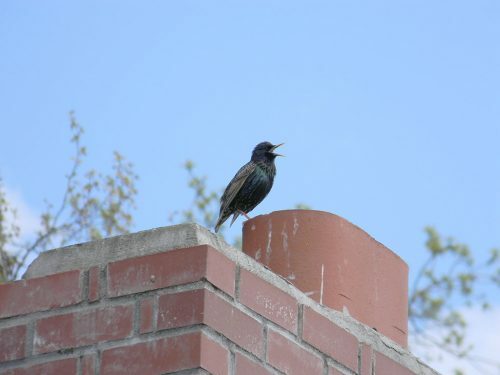 He will then start to perch near the nest, singing and flapping his wings, in an attempt to attract a mate. Once a female has been attracted, some form of unspoken contract is made and both claim the nest as their own. The female will then, in a very poetic twist of fate, start removing some or all of the interior furnishings in order to make sure that it is her nesting material that is used. This year, we plan to use cedar shavings in the nest ahead of time to help soak up some of the droppings; something we’ve previously done for winter weatherization; it should be interesting to see what, if any, will remain. This generally happens in mid-to-late March in our neck of the woods. 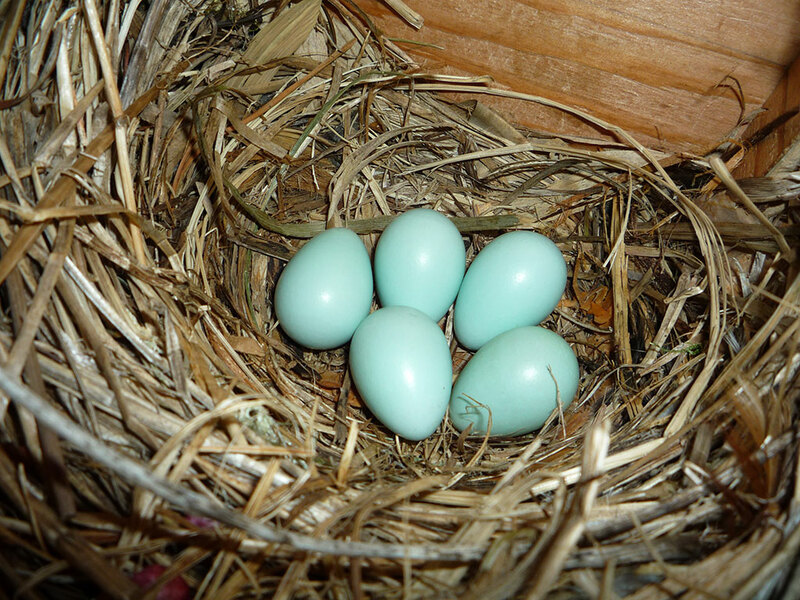 Eggs are laid in the nest, one egg per day, at approximately the same time. Generally speaking, a total of 4-5 glossy, pale blue eggs are laid. 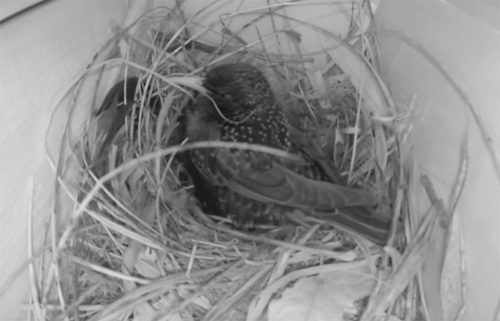 European Starlings know to limit/adjust their body coverage (heat) over the eggs to help prevent incubating the eggs in sequence; this way, all the eggs will hatch at the same time (plus or minus a day). Approximately early April, with a repeat performance of this and the further steps in late May. 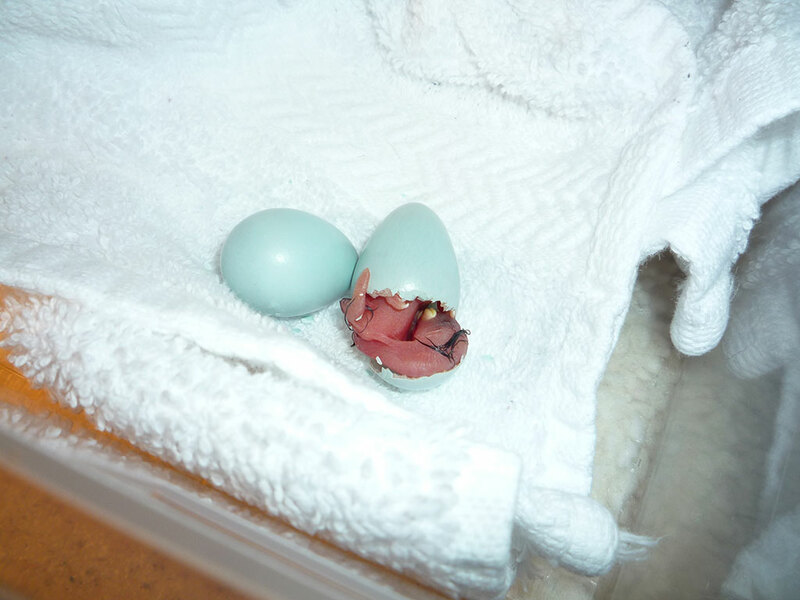 Once the final egg is laid, the eggs will receive regular rotation by the parents and they will start applying full coverage and heat. They will do this consistently for approximately 11 to 13 days. We’ll call this “Day 1” for reference. The babies will be born with their eyes closed shut and will remain this way through Day 6. They will be totally dependent on the parents for food and warmth. Mom and Dad will alternate feeding and take out “poop sacks” from the babies as they fly out of the nest (dropping them along the flight path out of the nest). Note to self: Time to move the cars. If you are planning on adopting a European Starling, this is the time to do it. Once their eyes open, the visual imprinting begins. The earlier, the better. Now the real work begins. They need to be fed every 20-30 minutes during the day for a minimum of 12 hours per day. 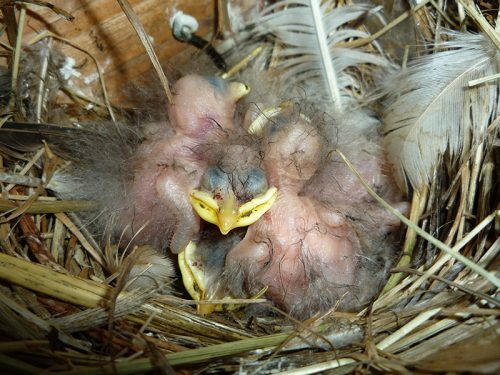 Once they start growing some feathers, you can reduce the feeding to every 45 minutes. As soon as they are fully feathered, you can reduce feeing to every 1-2 hours. There will be some overlap with the following stages. Around this time period, they will start to want to cautiously explore their surroundings. Introduce them to their toys and the areas of the house that you will be keeping them in. Lock up the cats, because the next stage is a doozy (see next stage, below). They grow up so quickly. Be prepared to be amazed. If you’ve done a good job of interacting with them, they will have bonded with you and will fly to you if encouraged. The image below was just prior to his taking flight. 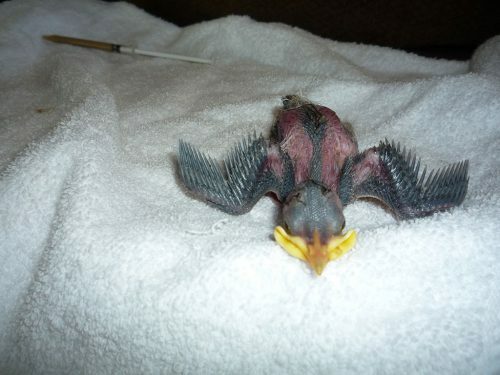 One should never feed a baby bird water directly. They’re not prepared for it and it can actually kill them (the mechanics are unknown to us), and they get the moisture from the soft food mixes that are their meals. However they can now have their baby food available from a bowl, as long as you continue to hand feed them. You can also provide a small bowl of water. While they are still eating the baby formula, they can now eat independently on their own (we’ll write about this later on, because normal bird diets purchased from the stores won’t be adequate for their health and nutrition needs). This stage varies greatly between weeks 6-10, so your baby might need a longer period of time before they are ready for independent feeding. You’ll still see some begging for being fed; you can indulge them to some degree still, however don’t hand feed them unless asked by them. Your babies will start to grow out their new feathers around this stage. You can switch them to their adult diet at this stage. The rule of thumb we’ve used is to begin when they’ve been eating independently for at least three weeks). You will be surprised at what they will begin to start saying. Don’t be deceived; they’ve been listening to you all this time and have selected what they consider to be their “flock song”. 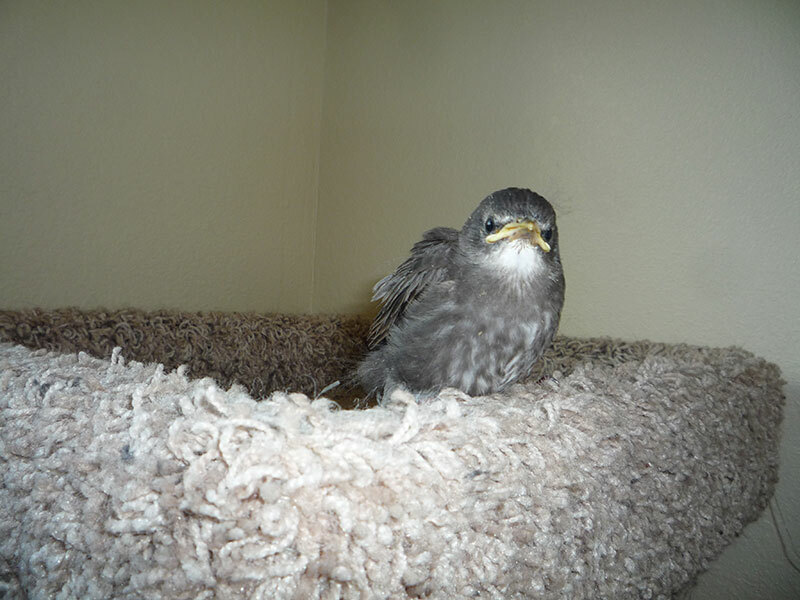 They may make general bird noises; they may mimic the TV or you or your partner. A magnificent transformation will occur. 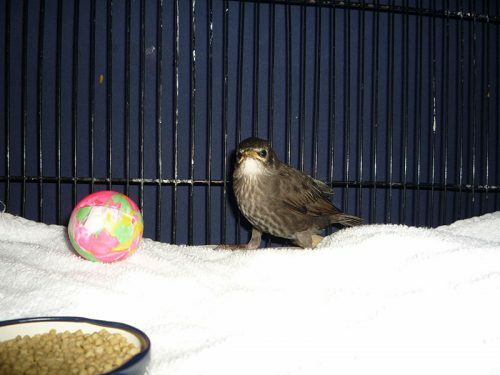 The picture below is only a partial change in feathers; we’ll get a better one next time around. Interesting timeline (though they DO start out kinda ghastly). I like the description of their “flock song”: could you actually manipulate this by intentionally repeating a phrase to the bird (and other household members) during this formative phase — e.g. intentionally saying the phrase “What up, G?” or “Who’s da man?”, or “Dude ho”. Hello. 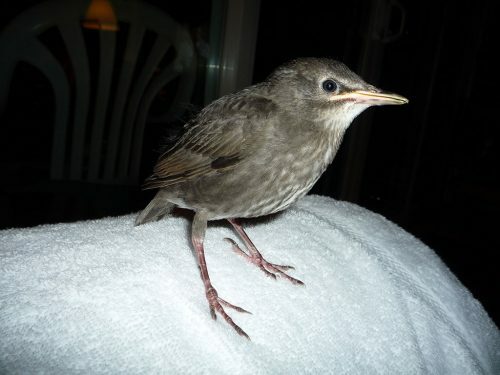 I have raised a European starling from around day 2 or 3 of hatching. She/he is an amazing bird, so smart and healthy. Follows me everywhere in the house. She is eating mealworms on her own. The question I have for you is, what do you consider adult food? How fun! They are really adorable and loving; glad you’re able to get the experience! Mealworms are great treat foods, but not enough to for their long-term dietary needs. We’ve been working on an adult diet page, but in lieu of this you can refer to the Starling Talk Adult Diet page. 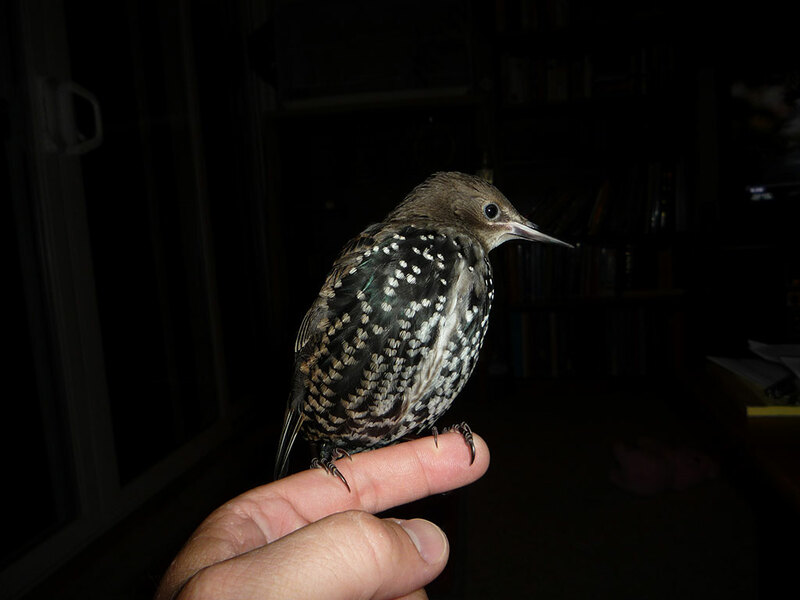 Having had a few starlings not make it past four or five years of age and dying due to lack of proper nutrition has been enough to convince us to stick to a strict diet that works (manifesting in feathers loosing adhesion; beak detaching from upper portion of the head; seizures; etc). I’ll see about getting an updated diet page put together that can be of use. I fed her insectivore mix with mashed hard boiled egg and dried mealworms with additions of little slugs(!) and the odd freshly dead insect and later some blueberries and cherries. I was scared for her but happy too when she began roosting in neighbouring property’s trees but if I called her she would generally fly back or come if her own volition. She had a wonderful time bathing and drinking from a punch bowl of water and could hold her own when other birds came to share the food bowl. I saw her relatives join her on the tv aerial on the roof (ecstatic that she was ‘accepted’!) Then 2 days ago she flew off and has not been back and though I miss her, I’m confident she’s capable of looking after herself. I loved helping her grow it was a joy and a privilege! I’m glad that you’e had the experience of helping one back to health! They are amazing creatures and we are often surprised at how unique each one’s personality is.